Don't be alarmed, Stoli's newest vodka flavor isn't zebra, it's merely one way of making an entrance and of being original, just like the vodka brand itself. 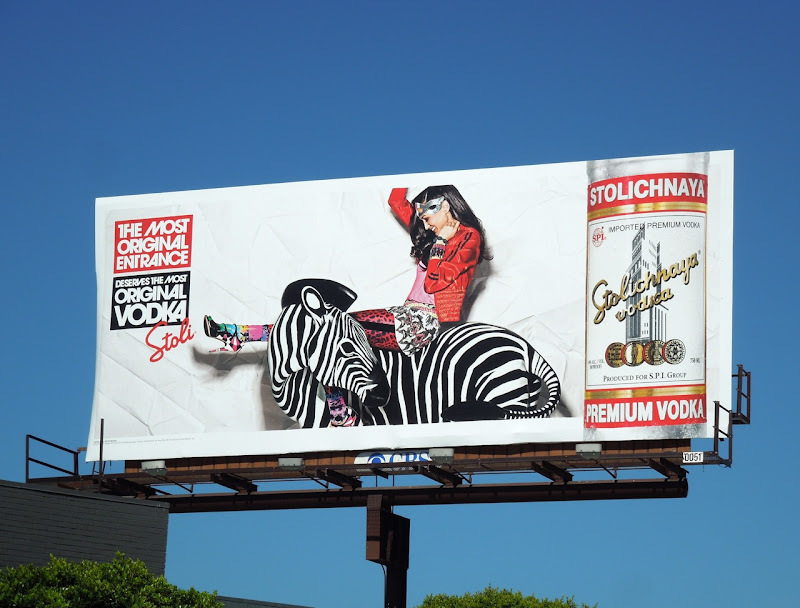 This eccentric creative is the latest Stoli Vodka advertising campaign and certainly demands to be seen. 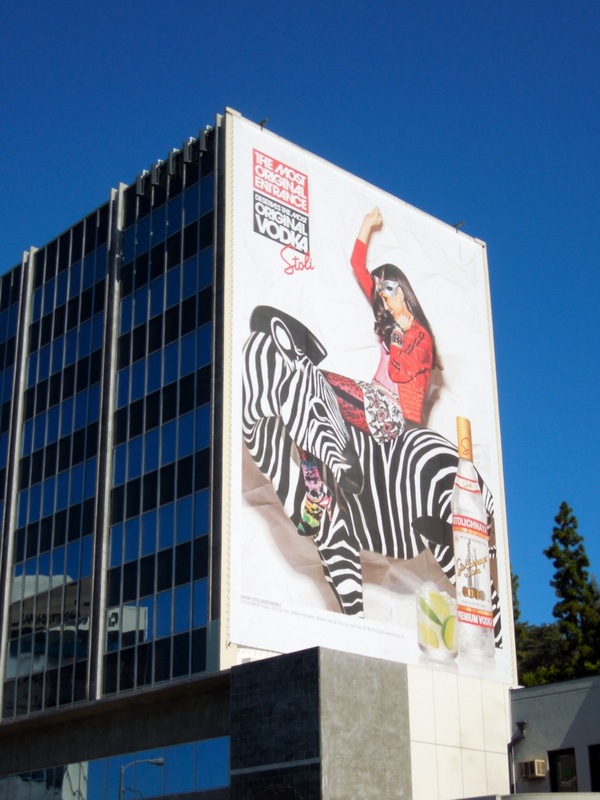 This fun extra-large billboard was snapped along Sunset Boulevard in West Hollywood, plus the landscape version was spotted along Beverly Boulevard near Robertson Boulevard on June 27, 2012. 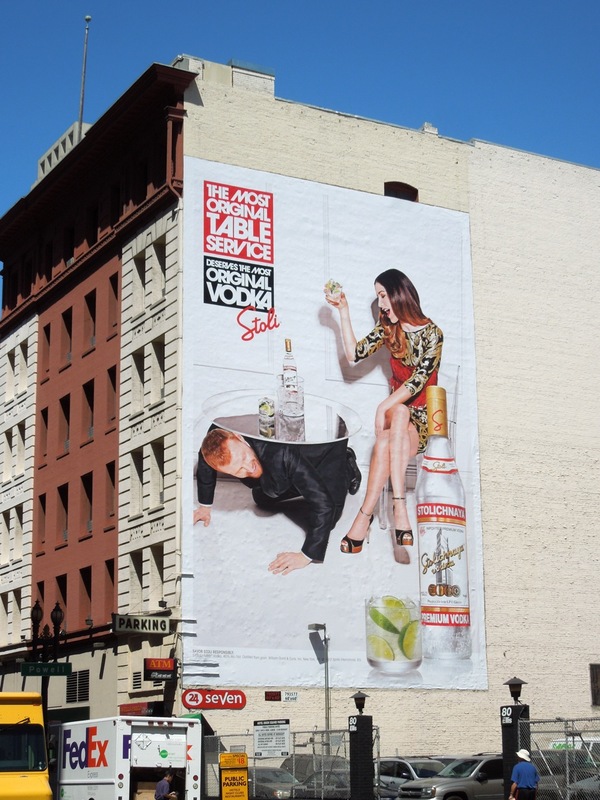 You can compare this 2012 creative to the previous 2011 Stoli ad campaign, where the vodka bottle was much more the hero, to see how much more vibrant and less static these new billboards. 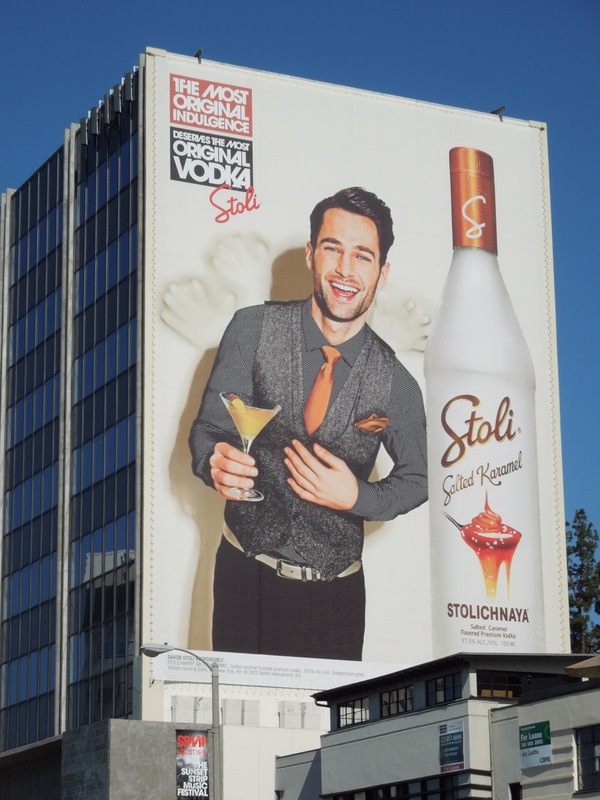 UPDATED: Stoli look like they are having lots of fun with their new 'Most Original Vodka' campaign. 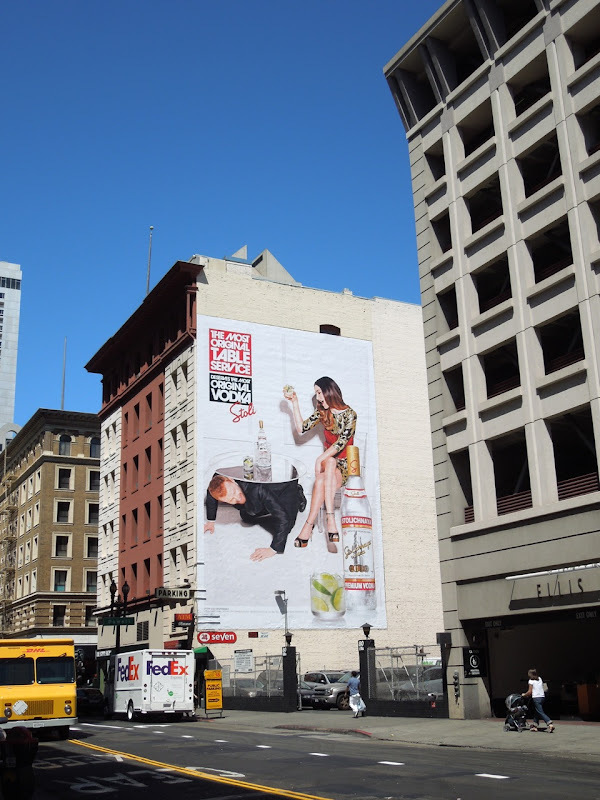 Here's another creative execution from the streets of San Francisco on July 30, 2012, with the tagline 'The Most Original Table Service' and accompanying witty visual. 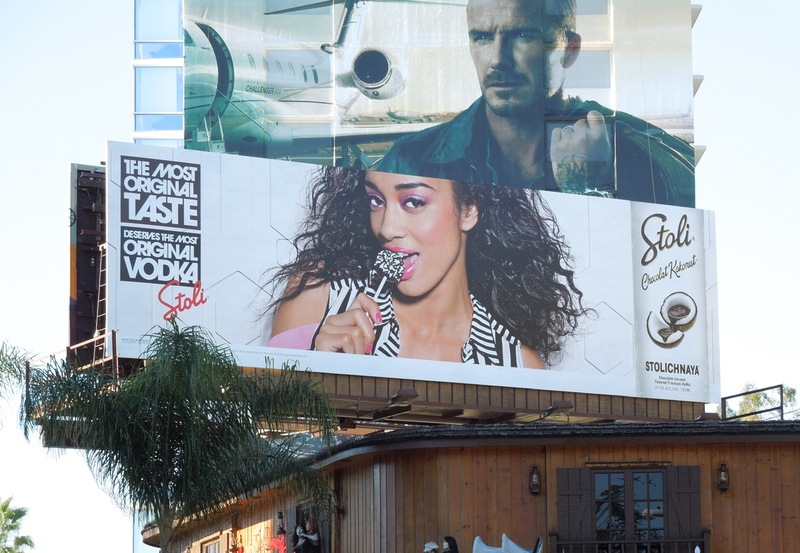 The ad certainly makes an impression, even from a distance. 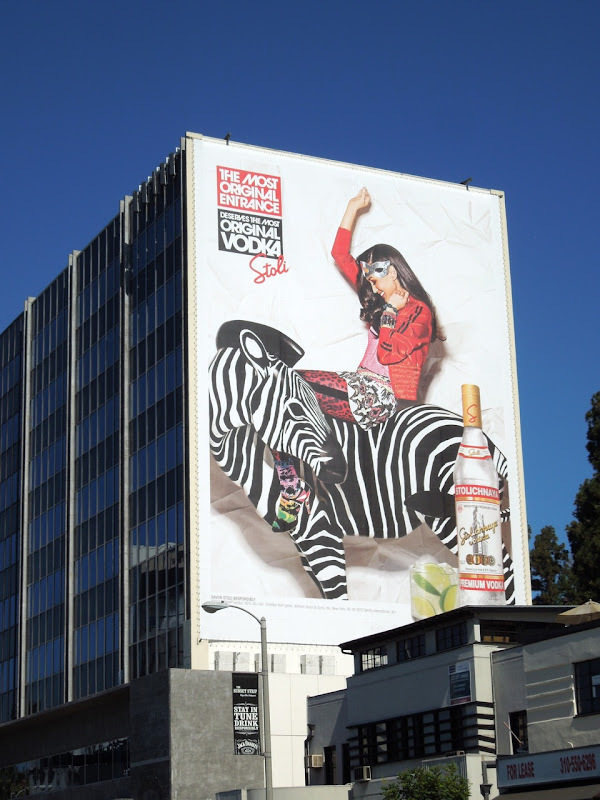 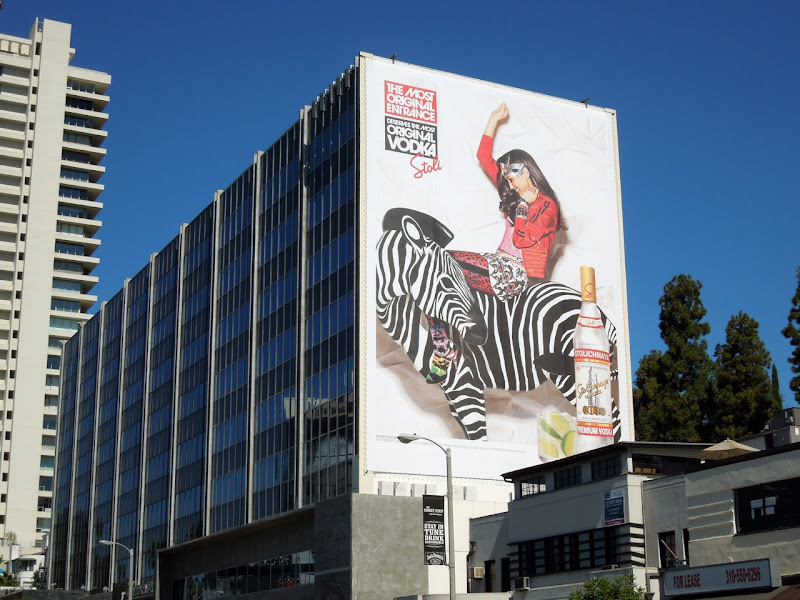 UPDATED: Stoli continues its ad campaign with new super-sized billboard along the Sunset Strip replacing the zebra creative. 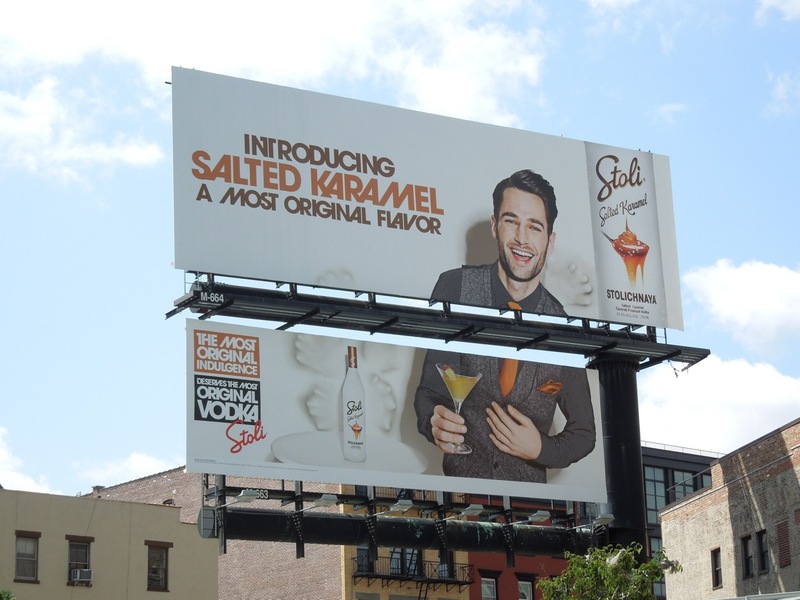 This tasty 'Most Original Indulgence' version for Stoli Vodka's Salted Karamel variant was snapped on August 14, 2012. 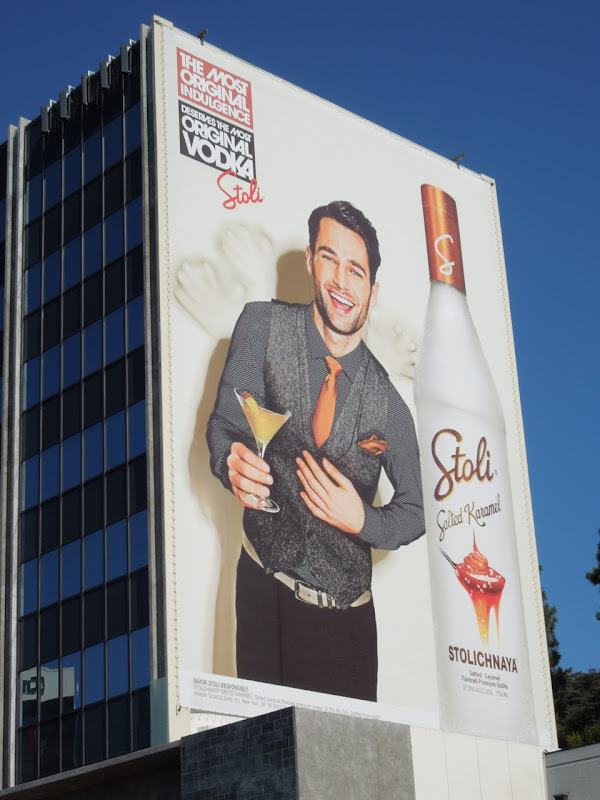 The ad looks the most simple and latest quirky so far, until you see those hands in the background reaching through the wall for the gorgeous guy's cocktail. UPDATED: Daily Billboard certainly gets around, from L.A. to San Francisco, and even billboard-spotting this Stoli Salted Karamel ad in New York City's Meatpacking District on August 28, 2012. 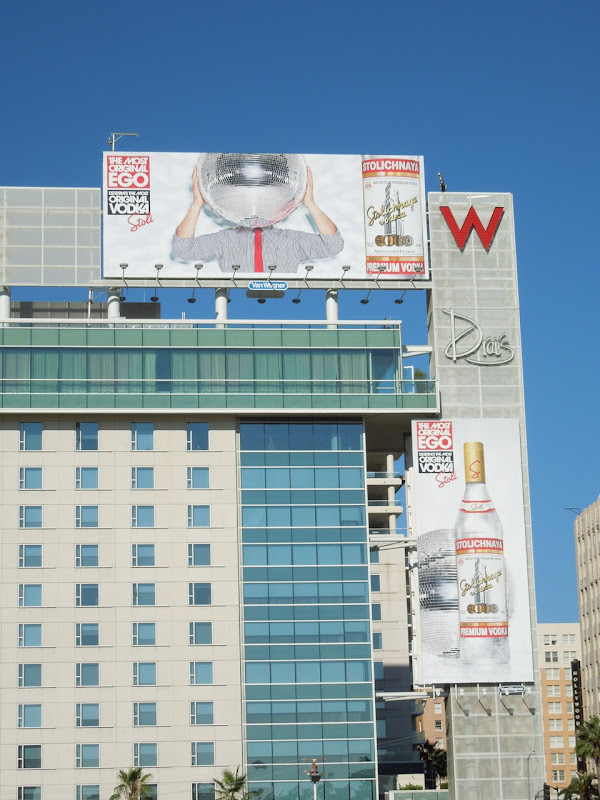 UPDATED: The Most Original Vodka campaign continues in Hollywood with this collection of disco ball creatives. 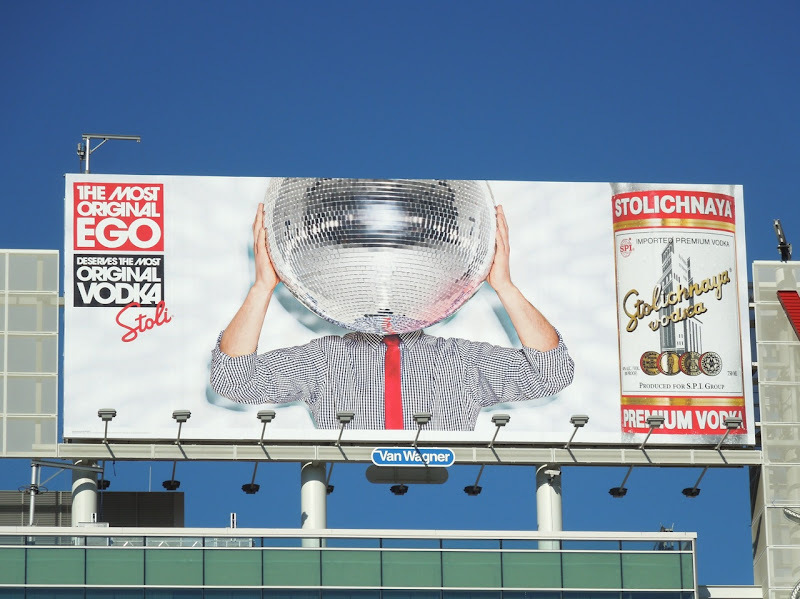 Both use the same glitterball creative, with slightly different taglines. 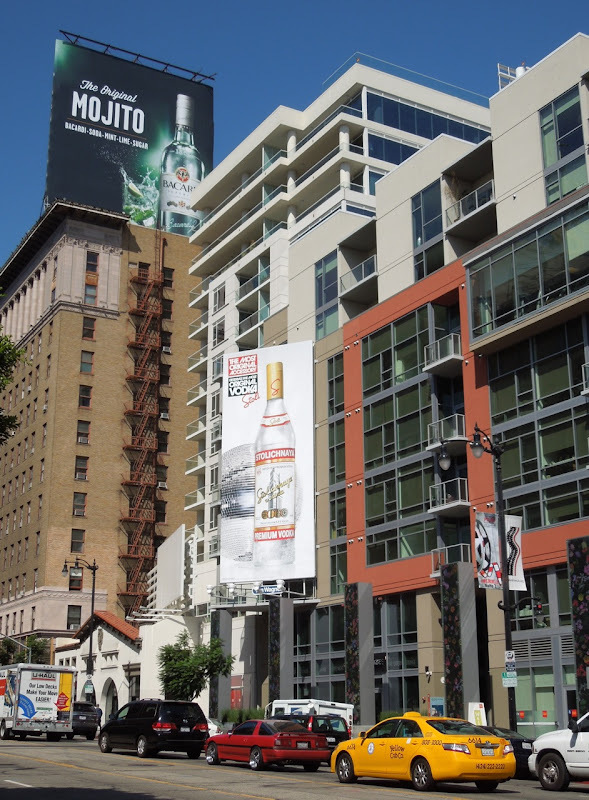 This first example along Vine Street is 'The Most Original Accessory'. 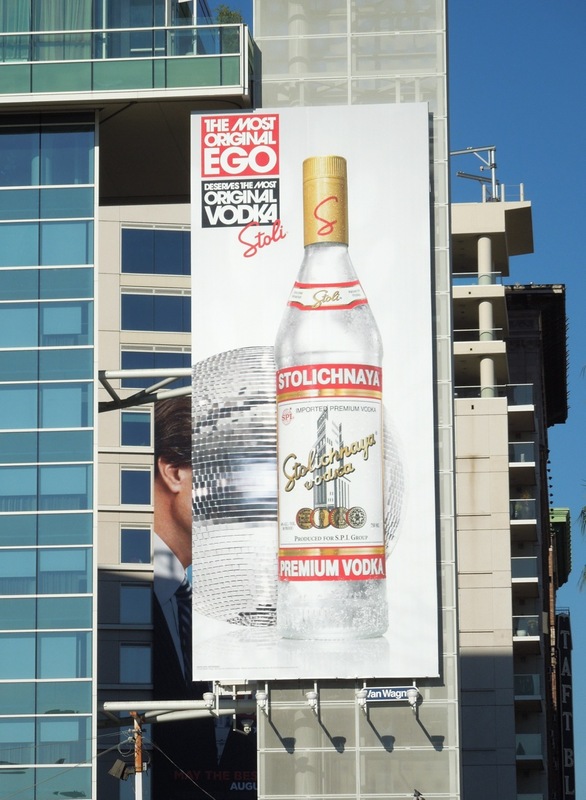 The other similar creative sports 'The Most Original Ego', with an additional billboard featuring a guy with a giant disco ball in place of his head. 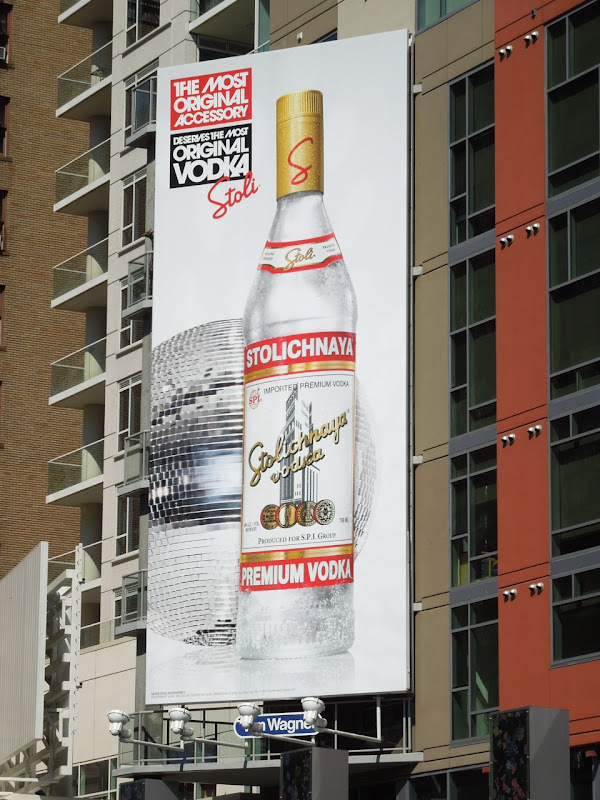 These fun vodka billboards were snapped on the side of Hollywood's W Hotel on September 15, 2012. 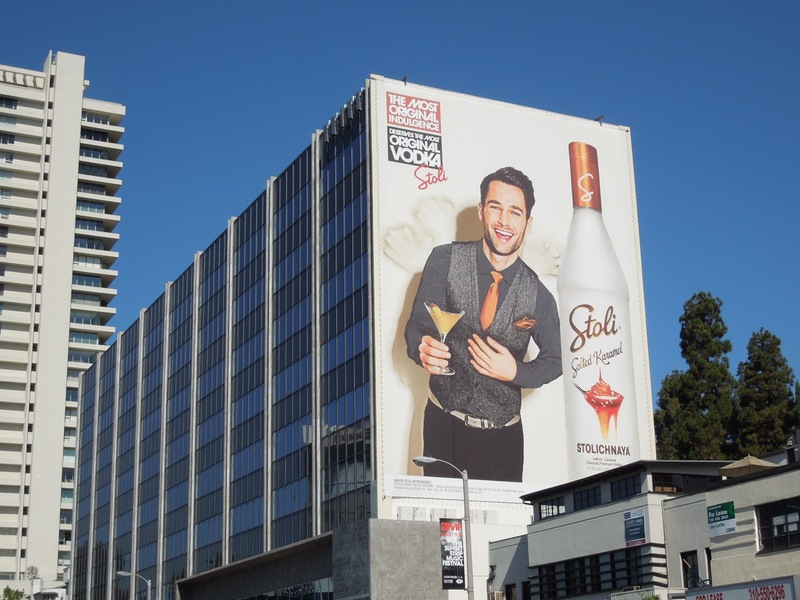 UPDATED: Here's a cheeky new billboard for the latest taste sensation from Stoli, Chocolat Kokonut, spied along the Sunset Strip on January 3, 2013.